A clean, cozy and reasonable hostel in Hida Takayama region. It is about 18min walk from JR Takayama Station, and conveniently surrounded by traditional craft shops and restaurants. Located on a hill, it overlooks Takayama City and also has a beautiful view of Northern Alps. Guest rooms include mix dorm for 8 people, female dorm for 6 people, twin room,private room for 2 people, triple room for 3 people, quadruple room for 4 people.210cm long size bunk beds are prepared in the mix dorm, trying to make it comfortable for tall guests to sleep. The female dorm is spacious and very relaxing. 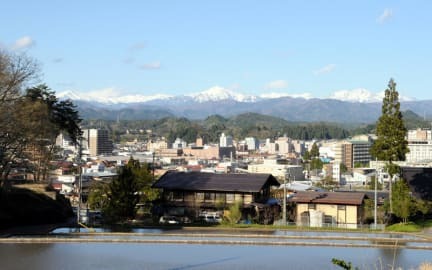 In either dorm room, one can enjoy a great view of the Northern Alps and Takayama City. The twin room is cozy and also spacious. The calm and peaceful mountain village scenery outside the window is beautiful all year long. 210cm long size 2 bunk beds are prepared in the private room for 2 persons ,the triple room and the quadruple room as same the mixed dorm. There is a tourist information desk right by the front desk, with many brochures on famous sight-seeing spots in Hida region. A desktop PC is available to the guests FREE of charge. Please feel free to use the guest kitchen. The electric cooking stove, refrigerator, microwave oven and toaster all can be used FREE of charge. The shower room and the restrooms are shared by all guests. Luggage storage service is available before check-in and after check-out. You can deposit your valuables with the front desk. .The entire building is non-smoking. However, there is a smoking area in the garden outside the guest house. .Payment is Cash (JPY) or credit card (Visa, Master). .Coin-operated laundry machine and dryer are available. .5 FREE car parking spaces. There are also municipal free parking spaces near the guest house. .Vending machine, shops, fax service (charged) available. From JR Tokyo Station to JR Nagoya Station, by Nozomi, Tokaido Shinkansen, 104min. At Nagoya Station, switch to super-express train Wide-View Hida to JR Takayama Station, 155min. From JR Shin-Osaka Station to JR Nagoya Station, by Hikari Shinkansen, 52min. 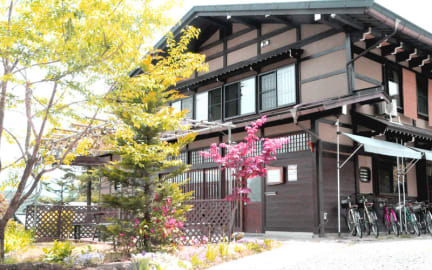 The guest house is 18min walk from JR Takayama Station, a distance of 1.4km. After getting out the exit of the station, walk right on the main street for about 300m, turn right at the traffic light and walk west on Shirakawa Hwy (Rt. 158). Walk for about 700m, pass Rt. 41 and the Kamioka-honcho-minami intersection, and turn left at a crossroad where there is a sign on the left side of the street says 'Entrance to Hida-no-sato' (200m from Rt.41). Walk south for about 200m (3min), and the guest house is on the left side of the street. You can also take a city bus, known as SARUBOBO Bus, bound for Hida Sekai Seikatu Bunka Center or Hida No Sato direction from Takayama Nohi Bus Centre next to JR Takayama Station. Get off at Minzokukanguchi bus stop, walk west for a few steps and turn left, and walk south for 3min to the guest house, which is on the left side of the street. The bus fair is 200yen/person. It takes 5 min by taxi from JR Takayama Station, at the cost of around 1000yen. My two friends and i very much enjoyed our stay here. The beds were comfortable and well-kept. The staff was very nice. It was great to be able to use the kitchen for breakfast. Other guests were friendly too and it was nice to interact with them. The space was very open and comfortable and homey. We're really glad we stayed there. Wonderful stay in Takayama. Will come again and stay there definitely. Staff and other travelers are nice and kind. Thanks Sakura Guest House. I really really love this guesthouse. I have stayed here a few times and every time it's so wonderful. Perfectly situated in the quiet hillside, but not a far walk from the train station and super close to many restaurants. There are always new wonderful people to meet here. My favourite part is the little outside area, that lights up with fairy lights at night. The perfect place to sip an asahi and unwind. Really cozy place just down the street from Honda Folk Village. Comfortable accommodations for a very reasonable price. Would definitely stay again! Homely hostel! Everything was spotless clean and the location was really ideal for me as I wanted to hike nearby trails and stay away from main streets. The bakery Noboriya nearby is stunning - I ate their everyday! The staff is very helpful, the toilets/showers were always clean and available and the bed was super comfortable. Only 2 improvements - I wish they would let me use my own lock for lockers and the atmosphere was better - needs more solo travelers, better common areas to hang out. We really enjoyed our stay at Sakura Guest house. The facility is very well taken care of and very clean. The staff was friendly and helped us get to the bus station. We would definitely stay again. We enjoyed our stay, it was really cozzy and warm. It is close to hida village and we appreciate the free shuttle pick up. Place was pleasant and clean. A bit out of town center, but has free shuttles in the morning. A walk from the station, but there are buses etc... a great comfortable bed for some rest. A bit far from town centre but free bus provided by hostel in morning.